I have lived in Medellín for over six years but have traveled to Cartagena over 20 times for both business and pleasure. In fact, Cartagena was the first city I discovered in Colombia back in 2006. This mountain city and coastal city are Colombia’s two most popular expat destinations. 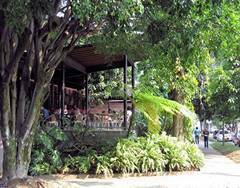 The 24-hour average temperature during the year in Medellín is 72°F (22°C). Medellín is known as La Ciudad de la Eterna Primavera, or the City of Eternal Spring. By comparison, Cartagena’s 24-hour average is 82°F (28°C). In Medellín, the average daily high temperature is about 82°F and the average low about 62°F (27.6°C and 17°C). In Cartagena, the daily high averages just under 89°F and the low about 75°F (31.5°C and 24°C). The record high each year in Cartagena is typically around 104°F (40°C). Due to the hotter climate, air conditioning is definitely needed in Cartagena, but in Medellín you can do without. One area where Cartagena beats Medellín is in seafood restaurants. As Cartagena is on the coast, you’ll find more and better seafood restaurants here than is found in Medellín. Cartagena wins here. Cartagena is one of the oldest cities in the Americas, founded in 1533 and boasting a rich history. In 1984, Cartagena’s colonial walled city and fortress were designated a UNESCO World Heritage Site. 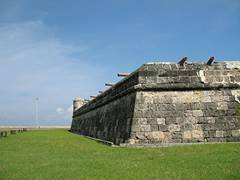 Cartagena has had an interesting confluence of cultures over the past 500 or so years, which includes the cultures of the Spanish, Native Americans, and Africans. In comparison, Medellín is a younger, less diverse city that never enjoyed Cartagena’s prominence, so the city and its culture are more contemporary. Medellín takes this category. Properties I have seen in Cartagena (off the beach) tend to rent or sell for at least 30% more than in Medellín—or even much higher. Of course, beachfront properties cost more. I looked at two-bedroom, two-bathroom apartments for sale in Cartagena in good locations, sized at about 100 square meters, to find how Cartagena compares to other cities in Colombia. Electricity costs in Cartagena compared to Medellín will typically be at least 60% to 70% higher due to the need for air conditioning. Other costs like groceries, restaurants, and other things tend to be at least 5% to 15% cheaper in Medellín compared to Cartagena. In general, Cartagena is a more expensive place to live than Medellín. This is arguably a tie. Both cities have many things to do in the city as well as plenty of things to do nearby. As a beach location, Cartagena has quite a few water-related activities that aren’t found in Medellín. This includes boat trips to nearby islands (particularly the Rosario Islands with 27 islands), scuba diving, deep-sea fishing, and so on. Medellín has many more churches and shopping options because it’s a much bigger city. In this nationwide study, Medellín came in first… citizens felt the safest in Medellín’s barrios, with 75% of respondents feeling secure. Cartagena ranked the worst, with only 30% of respondents in Cartagena feeling safe in their barrio. In general, the tourist areas of Cartagena, including the walled Centro Histórico, Bocagrande, and El Laguito are relatively safe—but take care after dark when the streets become less busy. Medellín wins here. Medellín has eight of the top-rated hospitals in Latin America; Cartagena has none. Being a bigger city, Medellín also has more medical and dental providers. Medical costs also tend to be somewhat higher in Cartagena then in Medellín in my experience. Cartagena wins here. The World Health Organization (WHO) last year reported that Medellín was ranked #9 in a list of the 10 most polluted cities in Latin America. Located in a valley surrounded by mountains that don’t allow easy movement of air in and out, pollution tends to stay in Medellín’s metropolitan area. Though fairly regular rain in the city can clean the atmosphere. Cartagena is located along the coast, so there are frequent ocean breezes that help keep the air clean. Cartagena wins here. Traffic in Medellín is generally much worse than in Cartagena. A survey by Waze a couple of years back rated Medellín as one of the worst cities in Latin America in terms of traffic. 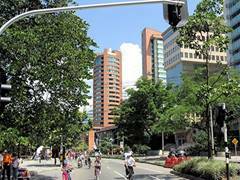 And while the traffic can be awful anywhere in Medellín, the worst traffic is found in the El Poblado and Envigado neighborhoods during rush hours, in my experience. Medellín wins this one, although both cities service the same destinations in the States (Atlanta, Fort Lauderdale, Miami, and New York). Otherwise, Medellín’s airport is the second largest in Colombia, with nonstops to 13 international locations in the United States, Europe, and Latin America. Cartagena has only seven, and no flights to Europe. 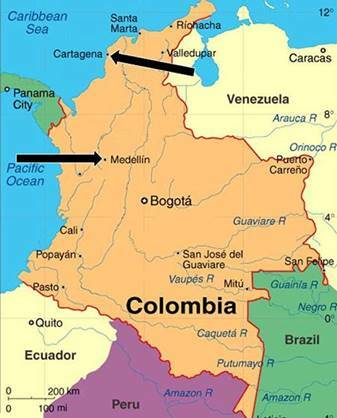 Domestically, you can fly nonstop to over 30 cities in Colombia from Medellín but only nine 9 cities from Cartagena. While there are English-teaching job opportunities in both cities if you are a native English speaker, competition is fierce and the pay isn’t the best. More English-teaching jobs are available in Medellín. Both cities have extensive bus routes and inexpensive taxis. Unlike Medellín, the taxis in Cartagena don’t have meters, which results in gringo/tourist pricing by the drivers… something that can’t happen in Medellín with metered taxis. Medellín wins here. Mosquitos and other bugs can be a problem in Cartagena. Medellín is at a high elevation, so it doesn’t have many bugs. I have lived in higher floors in high-rise apartments in Medellín for over six years, sleeping with the windows open with absolutely no bugs… and I have never seen a mosquito. Where Cartagena really shines is when you compare it to other Caribbean locations. The lack of hurricanes and the low prices caused by today’s exchange rates make it an attractive alternative when compared to the rest of the Caribbean. 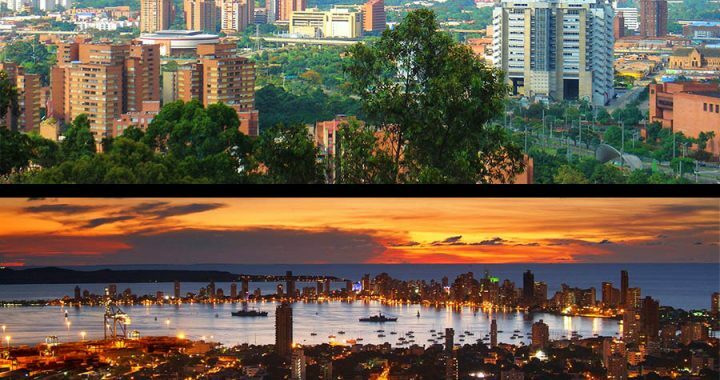 In reality, comparing Cartagena to Medellín is more like comparing two lifestyles: an Old World, beach lifestyle compared to a modern, urban, mountain lifestyle. 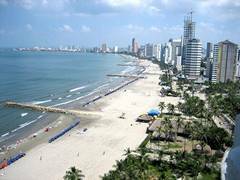 Posted in Live And Invest Overseas Confidential and tagged Cartagena vs Medellin, Jeff Paschke, live and invest overseas conferences, pros and cons medellin and cartagena.